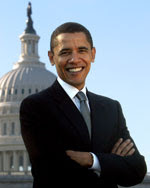 With a little help from Madison Avenue, President Obama hinted today that he is considering changing his very popular presidential campaign slogan from ‘Hope and Change’ (which helped get him elected in 2008) to ‘New and Improved’, which he hopes will change the chances to get him reelected in 2012. Copyright © 2008-2012 by Robert W. Armijo. All rights reserved.